This article was contributed to usacycling.org, where it was also posted on April 30, 2012. “I just bought a $2,000 power meter, I’m faster.” Are you? One of the single most important purchases that can be made by any cyclist who wants to be faster is a power meter. However, a power meter alone won’t do you any good if you can’t interpret the information. Power meters have been around since the early 1980’s. SRM was the first to market with its crank-based unit, utilizing strain gauges within the spider of the drive side crank arm. This technology hasn’t really changed much in 20 years although today’s products are more reliable, lighter and wireless. The use of ANT+ wireless protocol is an advancement that allows users to mix and match computers and power meters. There are now more than seven direct force power meter manufacturers worldwide. (Note: I should mention that when I say “direct force power meter”, I am talking about a device with a direct force measurement. Many computer and even smart phone manufacturers are offering wattage data that is calculated using a very complex algorithm to create a pretty close approximation of a rider’s wattage. While that might work for some people, it probably won’t work for serious racing cyclists and coaches. iBike uses an “opposing forces” algorithm along with an accelerometer to get their data, and it does produce pretty accurate numbers). So what now? You spent big bucks on this device and it spits out all this data. How do you interpret it? This is where you separate yourself from the pack: with the knowledge of how to use a power meter. I’ll start by saying this: it’s not a quick and easy task. I strongly recommend reading the book Training and Racing with a Power Meter, 2nd Edition by Hunter Allen and Andy Coggan, PhD. Hunter Allen and Dr. Coggan go deep into explaining how a power meter works, along with giving you simple steps to guide you in learning how to train with a power meter. They explain how to find your training levels, your functional threshold power, and your strengths and weaknesses; and provide a mathematical formula to create your “Peak Form”. It’s very in-depth, but we can dive into some of their topics here. Winning at cycling has a lot to do with your power to weight ratio or “watts per kilogram”. It’s a pretty simple formula. Power equals the amount of work divided by time in simple terms, and on a bicycle that’s how hard you pedal multiplied by how fast you pedal. So training with “watts” or “power” is essentially measuring how much work you are producing. You propel your body (and bike) down the road battling all these counter forces. The biggest counter force is you, your mass. Simply put, if you decrease your mass and increase your wattage, you will go faster. This is the objective throughout all sports. If the bat swings faster (more power), the ball goes farther. A lighter race car means the car can accelerate quicker. A lighter bike can mean a rider moves faster uphill, all things being equal. These are all examples of the “watts to kilogram” principal. We won’t go too much into the “weight” side of the equation here, but in addition to making your bike lighter, being at the right cycling weight is key. Hunter Allen published two training plans for Bicycling Magazine to help you get to your ideal cycling weight. So what can we produce and for how long? That’s the question we’re all trying to answer. We need to identify some intensity levels and limits for ourselves before reaching for some far out wattage numbers. There is a sustainable output that applies to each individual athlete, and we call this the Functional Threshold Power (FTP®). FTP is the amount of wattage a rider can sustainably produce for one hour. This is the simplest way to look at and gauge someone’s cycling ability. FTP is relevant to nearly all cyclists. Where it is less important is within the very short sprint disciplines, such as track or BMX where events are 200-1200m. But for the vast majority, knowing your FTP is very important. 20 min Time Trial average wattage X .95 = FTP. Here’s an example: your 20 min average power is 300w. Less 5% = 285w FTP. Once you have an FTP number you can begin to build your training levels around it. Why do we use a 20 min TT figure as opposed to 60 min? While FTP is really your 60 min best wattage for a time trial, unfortunately completing a 60 min time trial isn’t feasible for many of us. Using the 20 min test and deducting 5% is much easier, and is accurate within a few percentage points. Of course, if you do have power numbers from a 60 min TT such as from a race, that’s even better. But let’s back up a little. 300w could be good, or it could be bad. This depends on who’s doing the work and what they weigh. If Tony Martin (the current TT World Champion) produced 300w for 1h at his weight (I’m guessing around 82 kg or 180 lbs), he would only be producing 3.6-3.7 watts per kilogram (w/kg). Is this good? Not at his level. For men, 3.6 w/kg is about on par with a strong Cat 3 road racer of the same weight. So you can see, just focusing on the wattage numbers isn’t the entire story. Let’s keep going… So we have an FTP now. We know what our longer duration abilities are. But when a rider races mostly criteriums and cyclocross races and hardly ever competes in Time Trials or longer road races, is FTP important? Yes! Your FTP is the starting point around which you will base your future training. Have you ever gone out and just HAMMERED as hard as you can go…and then realized after just 1 min, “Ok, this can’t be maintained and I’ll have to slow down”? This is the relationship between “strain” and “intensity” within your abilities. The harder you go (strain), the shorter you can maintain that effort. There are gigabytes of data on the subject, most of which are covered in Hunter’s book, but the bottom line is that the more intense the effort, the shorter you can hold it. Conversely, the less intense the effort, the longer you can maintain it. This is again where your FTP comes into the picture. At FTP we call this effort 100%. Efforts below FTP are sustainable for longer and longer periods of time as the intensity decreases away from FTP. 120% of FTP is hard but maintainable for shorter than an hour. Level 1: 55% of FTP – Sustainable for the expected life span of most humans at 65-85 years. You could almost ride around the globe until you die at this pace. This is often referred to as Recovery. Level 2: 56-75% of FTP – 2.5h to 14 days. This is an easy pace, slightly over Recovery but still working. This is often referred to as Endurance. The upper limit here is admittedly somewhat arbitrary but assumes that there is little to no taxation on the rider and that they could ride continuously for many days as long as they had proper fuel. Level 3: 76-90% of FTP – 30 min to 8h. We call this Tempo or your “Sweet Spot”. This is where most of us live, be it in a road race, MTB race or even criterium. Some of the best ultra distance MTB riders can sustain this output for 7-10h without rapid fatigue. Tour riders also can put in some 7h days that average 85% of FTP. If the aerobic system is well trained and the athlete is fueled, this can be sustained for several hours. Level 4: 91-105% of FTP – 10 to 60 min. This is your FTP output. Many call this “Threshold”, “LT”, or “AT”. However you name it, this is and should be your mark of ability. Level 5: 106-120% of FTP – 3 to 8 min. This is now tapping into your body’s VO2max (total amount of oxygen you can take in). There is O2 usage but it’s limited. VO2max is an athlete’s maximal Oxygen uptake, or maximal aerobic uptake. VO2max is reached when an athlete’s O2 consumption reaches its peak or remains steady despite an increase in workload. This number is part genetic but also very trainable. The easiest way to increase your VO2max is to lower your body weight while increasing power. Level 6: 121-150% of FTP – 30 sec to 2 min. You are now exceeding your FTP and VO2max into what’s termed your Anaerobic Capacity. This is when you produce energy without oxygen. Anaerobic exercise induces anaerobic metabolism, which is separate from our day-to-day aerobic (with O2) system. The anaerobic system can only sustain itself for short time limits because it’s burning glucose and glycogen stored within the muscle (anaerobic glycolysis). This storage can’t be replenished fast enough at this accelerated rate and thus lactate is produced as a byproduct, which can be a limiter in extreme amounts. I should also mention that in this state you use mostly Type 2 (fast-twitch) muscle fiber. These muscle fibers fatigue much more quickly than Type 1. Level 7: 150+% of FTP – 5 to 15 sec. Lastly, your Neuromuscular Power. This is what your muscle can produce maximally, your max sprint. These power levels represent a rider’s real world capabilities. Can you push beyond each time range? Maybe – each athlete is gifted in his or her own right. But even if you surpass these durations, remember that as you cross these lines, one system will blend into the next and so on. It’s not as if once you leave 100% of FTP, stepping into your VO2max system, that your FTP system immediately shuts off. All these systems work synergistically, one assisting the other. A higher FTP output will bring your Level 3 Tempo output up as well. A higher VO2Max will increase your FTP, and so on. So, which power level do you train in? The answer is simple: train to the demands of your event. If you are an ultra-distance marathon mountain biker, should you be spending 3h per week working on your Level 6 sprinting? Probably not. Your best bet is to raise your FTP and subsequent Level 5 VO2max and Level 3 “sweet spot” abilities. Growth of your FTP will trickle into both, and if your event demands long hours you will have to put in long hours simulating race pace. What if I trained for this longer marathon race in Level 1 and 2? Wouldn’t that get me the preparation I need? Yes and no. Let’s go back to the concept of “dose and response”. If you “dose” yourself with many hours in Level 1 and 2 (Recovery and Endurance), you will adapt to that pace. You will teach your body to ride long hours at a slow pace. You won’t have much ability beyond that. Your endurance would be there but your speed would be low. Your body is responding to the stimulus of Level 2. Pretty simple – much like the adage “you are what you eat”, you are what you train for. In order to be faster you have to train faster and smarter. One of the many benefits to using a power meter is racing with a power meter, and the information collected during an event is invaluable. When you can look at the demands of an event and adjust your training to be event-specific, you will make huge gains. Again, keep in mind individual specificity. Just because you see a race file from a buddy that shows an average power of X watts over a certain time, doesn’t mean that’s what you need to produce to beat him. One wattage number can’t be equated to everyone, as power to weight ratio plays a huge role. The next step you must take is to calculate your w/kg across the power training levels to create your own Power Profile. Creating a Power Profile is like giving yourself a pop quiz across all subjects. Which is your stronger subject? Math or Science? Literature or Gym? Are you strong at the longer efforts or at the shorter efforts? The Power Profile chart is a tool that Dr. Coggan and Hunter Allen developed originally in the TrainingPeaks WKO+ software that is now also available on TrainingPeaks.com. The Power Profile chart summarizes your historical power data to display your average power across the various power training levels. 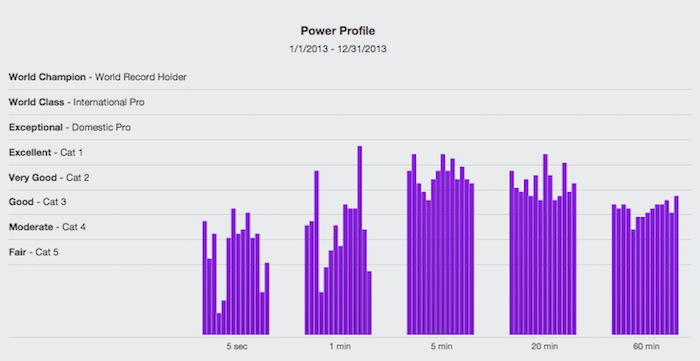 An example of the Power Profile chart from TrainingPeaks.com is shown below. Once you have created a Power Profile chart you can come back to it regularly, comparing gains or losses to better understand how you are improving within each specific strength and weakness. As a coach, I use the Power Profile all the time to keep an eye on my athletes’ progress. Regular testing of each system is key to a well-designed training plan. Say you are a crit racer with a mean sprint and can crack out 1400w for 5-10 sec at the drop of a hat. 1400 watts is pretty good for just about anyone! We are in the ballpark of 15.5-17 w/kg, which for a heavier guy (82-90 kg) is still strong. If this sprinter weighed 71 kg he’d be on par with a professional rider. But how many times can he put out that 1400w sprint? Let’s go on to say that our Sprinter has this incredible 1400w burst but has never won races. How can that be – he’s the fastest right? Well, to win you have to be there to sprint. To get there requires a high FTP and also a strong VO2max and Anaerobic Capacity to put yourself in the right place at the right time to delivery your blow. If all a sprinter did was sprint training and never trained at FTP or near FTP, we would never know his name. He’d never be present at the end of a race because he’d have been dropped well before. Training for specifics is always the focus, but the other levels can’t be ignored. Any experienced crit racer or sprinter knows that to get to the finish requires a series of well-orchestrated sprints. A rider has to continually accelerate to stay in position. This leads me to my final point: fatigue resistance. Fatigue resistance is as, if not more, important than wattage output itself. If aforementioned Sprinter can crank out 1400w once, that’s fine. But he’ll need an armchair ride to get to the line because that’s all he’s got! He never trains his lower levels and can’t sustain anything more than say, one or two hard short efforts. Enter Sprinter B! Our new “B” Sprinter has a max of only 1100w. He weighs about the same as our rock star Sprinter does, so the w/kg ratio favors Sprinter A. What Mr. B can do however, is produce 1100w over and over again and maintain 1000w for 350 meters. Who would you bank on to win? Sprinter B? Me too. Fatigue resistance measures the decline rate of one’s effort over time. If you monitor your sprints in training or racing you can learn quickly whether you have good or bad fatigue resistance by using a tool called “Fatigue Profiling”. This is a widget built into the Peaks Coaching Group website that can be found here. Enter your watts from your testing into the Fatigue Profiling chart to see your fatigue ratings. An athlete can have an incredible peak power but an equally incredible drop-off as we stretch out the time duration. World-class track sprinters, for example, can jump up to amazing power numbers but only for 200 meters. If you asked one to do that at the end of a 4h road race, the chances are high that our 90 kg Cat 3 would clean his clock. This all takes us back to ground zero, our FTP. Fatigue resistance is especially important in the road race or crit efforts. If you can bust out big numbers over and over for 5 min at a time, but lack a killer blow in the sprint, it would behoove you to wait for the final field sprint. You are better to attack a little ways out, trying your luck solo or in a small group nearer to the finish. The fact that you know where you stand makes the use of your power meter that much more important. Ever hear this one? “I am strong throughout the race but I can never seem to win!” Well that could be true. This rider probably has a stellar 30 min effort in him and can keep 350w humming along, but once the speed increases and the accelerations come he’s off the back. Why? Because his weaknesses are exposed. To combat this you have to change your tactics and your training. This rider needs to work for separation, distancing himself from the fast guys well before the line. Again, he knows what he can and can’t do because his power meter proves it. One last point and a few caveats. Power meters are not going to make you faster per se. Great athletes always push beyond what they are supposed to be able to do. That’s what greatness is: the ability to rise to a higher level. Pain management is still and always will be the name of the game. If you can handle pain you will likely excel. Think of a power meter as giving you a number to associate with that pain. And please don’t use power meter to limit yourself. There are some riders who become slaves to the number. Your power meter becomes your worst enemy, regularly telling you that you’re slow, tired or just flat that day. I make it a habit to ensure that my athletes learn to feel out the efforts internally as well as learning to use their power meter. Use the data both objectively and subjectively. The subjective approach can sometimes net you more than you think! At the end of the day your power meter will have answers, so study your data and ask questions. Test yourself and set some power goals. If you score well in the 5 min effort, attempt to bring up your 20 min numbers. If you strive to be a better, more balanced rider you need to spread the energy around while keeping a focus on the specifics of your events. Good things will happen! Co-author Russell Stevenson is a Peaks Coaching Group coach, USAC Level 2 and Power certified. He’s a multi-time national champion, works with athletes of all levels, and is available for new clients. You can reach him at russ@peakscoachinggroup.com. Hunter is a USA Cycling Level 1 coach and former professional cyclist. He is the co-author of 'Training and Racing with a Power Meter', co-developer of TrainingPeaks WKO+ Software, and is the CEO and Founder of the Peaks Coaching Group. He specializes in coaching cyclists with power meters and is on the forefront of coaching with cycling's newest tool. You can contact Hunter directly at www.PeaksCoachingGroup.com.